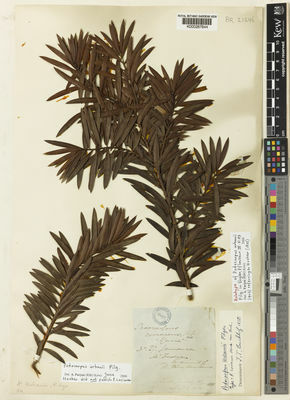 Genus: Podocarpus L'Hér. ex Pers. This species is accepted, and its native range is E. Jamaica (Blue Mountains). Podocarpus urbanii is rated as Critically Endangered (CR) according to IUCN Red List criteria and has received a EDGE score of 2.12, which places it in position 61 on the EDGE Gymnosperm list. It has a Evolutionary Distinctiveness of 8.55, ranked 370. More information on the EDGE Gymnosperm project here https://www.edgeofexistence.org. Mill, R.R. (2015). A monographic revision of the genus Podocarpus (Podocarpaceae): II. The species of the Caribbean bioregion Edinburgh Journal of Botany 72: 61-185.